Employees are able to submit timesheets via the self service portal. When logging into the employee self service portal there is a 'clock' icon showing on the dashboard, click on it to enter timesheets. By default the timesheet will show on the week that is currently being processed. If you want to change the week you can skip ahead using the arrow buttons or you can click the date button and choose a different date. We’ve designed the interface to be very keyboard-friendly for efficient data entry. For example, when entering start and end times you can simply type 9a and it will recognise it as 9:00am. Similarly, for example, 530p will be recognised as 5:30pm. If you have been set up to use ‘standard hours’ to pre-populate your timesheet click on the ‘Actions’ button and choose ‘Add standard hours’. Where you need to edit your standard hours, as mentioned previously, you can simply type 9a and it will recognise it as 9:00am. Similarly, 530p will be recognised as 5:30pm. Be sure to click 'Save' after making any changes. 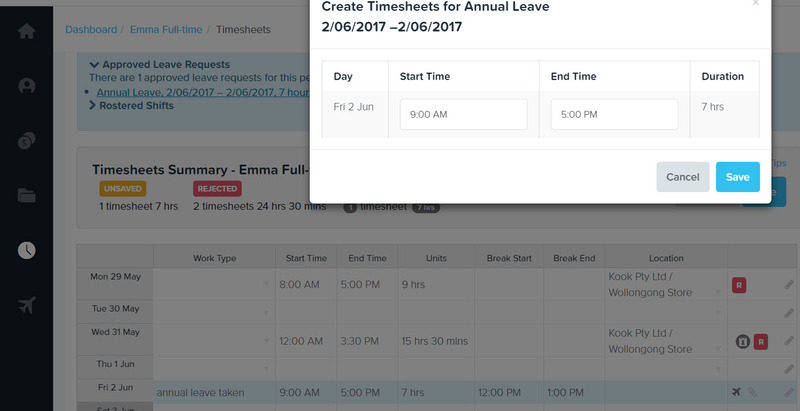 If you have an approved leave request, click the approved leave request banner at the top and click the annual leave shift that you’re going to import as a timesheet. Any leave shift however should reflect the hours that you would normally otherwise have worked. If you normally have a break, enter the break into the timesheet, and click ‘Save’. Once you’re happy with your timesheet click ‘Save’. An ‘S’ will appear next to your timesheets meaning your timesheet has been submitted. Where the timesheet line is a leave entry, an aeroplane icon will also show. Your manager will receive a notification that your timesheet has been submitted and ready for their approval.